As artisan bakers, we use only select flour, milk, butter, salt and sugar to make the dough that makes our croissants so light and airy and flaky. Then, we let it rest overnight. After the dough gets its beauty sleep, we perform all the rolling, laminating and shaping it takes to craft the perfect croissant. You can't go wrong with this classic. Take a bite and you'll understand why it outsells all others by two to one! A crunchier take on our classic, for those who like things a little nuttier. Dark chocolate cookie with white chocolate chips. Pure decadence! We pack these as full of peanut butter as physically possible for the creamiest cookie around. Grab some milk! This soft, chewy favorite is just like grandma made them - nothing flashy, just plain tasty. 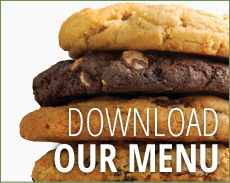 Our snack size cookies are baked when you order them and delivered warm! $11.00 for one dozen. ￼ $20.00 for two dozen. ￼ $8.00 for each additional dozen. A perfect sidekick for our warm treat-size cookies! Choose from four classic Blue Bell flavors: Vanilla, Chocolate, Cookies 'n Cream, and Mint Chocolate Chip. A Baker's dozen of our freshly baked large cookies packaged in a box. Forty of Blue Baker's famous freshly baked large cookies. A total of four dozen servings split between our assorted freshly baked brownies and treat-size cookies. The classic that can't be beat - our most fudge-a-licious brownie on the menu, studded with chopped walnuts and topped with a rich, smooth chocolate ganache. We dare you to eat more than one! A half-dozen freshly baked cupcakes of your choice.